Very attractive medium-sized evergreen of erect, open habit. 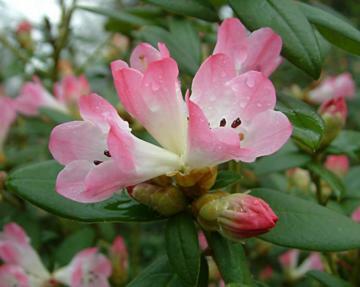 Smallish leaves and from early spring produces upright clusters of narrowly bell-shaped, almost tubular flowers which are white at the base, shading to pale pink and vivid deep pink on the outside edges. Hybrid of R. moupinense x R. spinuliferum.